Venice is one of the most photographed cities in the world. Every year, between 20 and 30 million tourists visit and take photographs. Lots of photographs. St Mark’s Square, gondolas and canals – they have all been photographed every which way possible. I wanted some photographs of Venice that were different to all the photographs I’d seen before. When you think about Venice, you think of the crowds of tourists. You may even picture an enormous cruise liner parked just off St Mark’s Square, on the Grand Canal, blocking everyone’s view. Everyone is in such a hurry to see as much as possible of this city in the least amount of time. That means that there is no time for anyone to stop and really admire. To contemplate and appreciate the beauty that surrounds you when you are in Venice. San Giorgio Maggiore is an island to the south of St Mark’s Square in Venice and near to the entrance to the Grand Canal. On it sits the Church of St Giorgio Maggiore, which was built in the 16th century and has a bright white façade. One of the most famous paintings of San Giorgio Maggiore is called San Giorgio Maggiore at Dusk, by Claude Monet. I’ve seen it in the National Museum, Cardiff. It is an incredible, atmospheric painting with the buildings surrounded by a gold and blue glow. I decided that I was going to photograph the church, not at dusk, but at dawn. If you have ever wondered how landscape photographers get those perfect reflections of hills in the Lake District or the Highlands of Scotland, it is because they get up before the sun does. Once the sun begins to rise, it warms the land and creates a gentle breeze that causes ripples across lakes and lochs. It is the same in the Venetian Lagoon. That is why I went for a 5.30 am start local time, 4.30 am UK time, which we had left the previous day. Without the crowds of tourists, Venice looks and feels completely different at this time of day. Even the pigeons were still asleep. The grandeur of its buildings is enhanced by the stillness that surrounds them. It feels tranquil and at peace. I wanted to photograph the Church of San Giorgio Maggiore from just outside the Doge’s Palace, on a thoroughfare called Riva degli Schiavoni. I would be looking south, so it meant the sun would be rising to my left. Apart from a few like-minded photographers, there was nobody to be seen. There were no gondolas and the lagoon was calm. I set my camera up on a tripod and waited. There is something quite magical about seeing the first rays of light creep their way across the sky in total silence. You almost feel like you are an intruder. Very slowly, the sky began to turn pink and blue. Lights on the church were reflected in the water and all the buildings began to glow. I was using a tripod and cable release, as I knew that I would be taking a series of photographs, each of which would last for a few seconds. I did wonder about removing the scaffolding from the photograph in Photoshop but decided against it. Good photography is about good story telling and, rather than presenting an idealised image, I wanted to show the truth. This most fabulous city is constantly fighting against the elements and is an on-going restoration project. Perhaps forever? 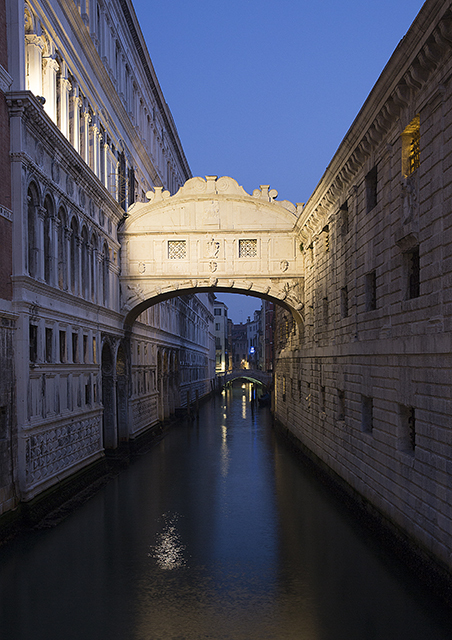 I then walked a few yards from where I had been standing and took this photograph of the famous Bridge of Sighs. During the daytime, the Rio di Palazzo that runs underneath it is full of boats and gondolas, but at this time of day, the river was empty. Around 6.00 am, the first Vaporetto water bus arrived, discharging passengers who were on their way to work in the city. I could hear their chatter as they hurried along Riva degli Schiavoni behind me. The silence was broken. A city and its people were stirring. Heading back to our hotel, via dark alleyways, I could smell coffee being roasted and freshly baked bread. A new day had begun for the people of Venice. A friend of mine saw this photograph on our website and immediately ordered a canvas wrap of it for his new house. When the canvas wrap arrived, my wife Liz insisted that I ordered another one for our house. It works well as a canvas wrap as most people think it is a painting, rather than a photograph. Use a camera, rather than a smartphone. I’ve written about this in an article I posted online here. Avoid taking photographs in the middle of the day when the sun is directly overhead. This will give you very flat, two dimensional photographs. You want shadows to create depth. Take photos in the morning and later in the afternoon, or if the light permits, early evening. Wherever you go, take some time to soak up the atmosphere of a place before you take your camera out. Listen to the noises, take in the smells and then work out which images will best remind you of this location. Don’t just photograph big views, take shots of little details as well. It varies from country to country, but always ask before you take someone’s photograph, especially if they are in uniform. 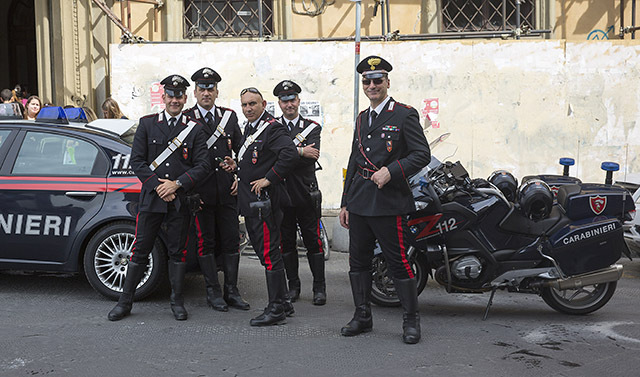 For instance, in Monaco, the guards at the Palace don’t let people take their photograph whereas the Carabinieri in Florence are more than happy to pose in front of their cars and motorbikes. Everyone understands what you mean if you smile and point at your camera. When you get home, have your best photographs printed and put into an album. Depending upon how skilled you are with a computer, think about making a slide show that you can put on your television. These days, most televisions will take a USB stick that can play back a gallery of photographs. In areas that are popular with tourists, never leave a phone or a camera on the table of a street café. Be discreet with your camera and don’t carry it on a strap, hanging off your shoulder – keep it in a bag, when not in use. Finally – take lots of photographs. Unlike the days of film, digital photography costs next to nothing once you’ve bought a camera. 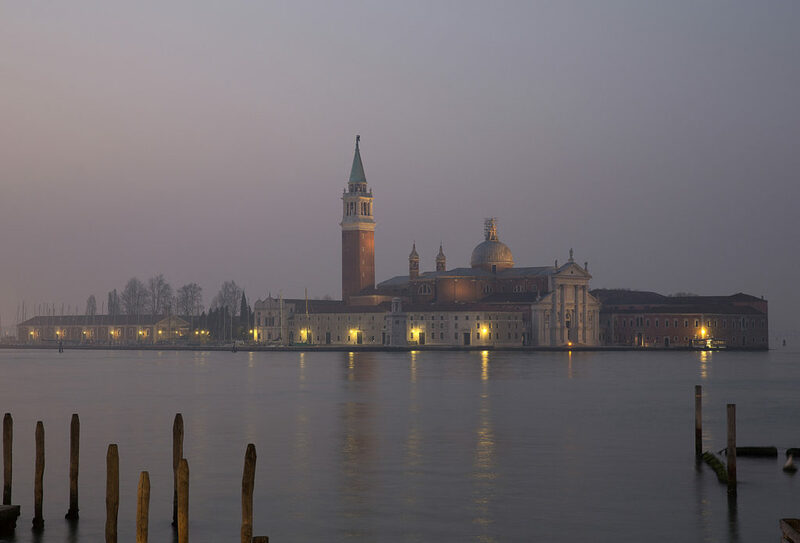 Photograph of San Giorgio Maggiore taken with a Canon Eos 5D Mk III and a Canon 24 mm – 70 mm f2.8L II lens at 61mm on a tripod. Exposure 2.5 seconds at f11. ISO 400. Photograph of the Caribinieri in Florence taken with a Canon Eos 5D Mk III and a Canon 24 mm – 70 mm f2.8L II lens at 45 mm. Exposure 1/320 second at f6.3. ISO 200. I thoroughly enjoy doing event photography. I like to chronicle people enjoying themselves, being given awards, being entertained and celebrating special occasions. Almost everything I know about event photography, I learned from a county magazine that my parents had a monthly subscription for and which they would pass on to me. It always painted a very positive picture of the county with good journalism and excellent photography. It made you feel good that you lived in this county. I would then turn to the social pages at the back of the magazine and that’s where I learned how not to do event photography. Pink, shiny faces. Middle aged men, saluting the camera with pints of beer like naughty schoolboys. Smudged makeup and poorly posed groups. These galleries of events in the county were not pretty. Whether you are an event organiser or someone who has been asked to photograph an event, I am going to share how I approach event photography. But first, I will tell you about the photograph at the beginning of this article. For the past five years, there has been an annual event in Lathom, Lancashire, which raises tens of thousands of pounds for good causes every time. It’s called “The Yabba Dabba Doo” party and it sells out every year. I photograph it each year and can honestly say that it has to be one of the most exciting events I ever cover. For the organisers, Having a Ball Events, it’s important that they have a portfolio of photographs from previous years that they can use on social media in the build up to the next party. 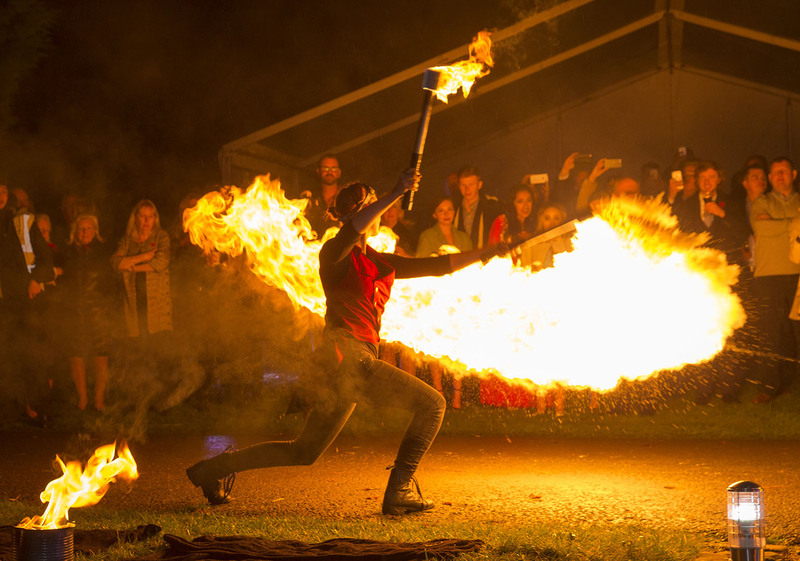 Fireworks are provided by a company that is currently the British Musical Fireworks champions and each year, there is entertainment in the shape of acrobats, fire performers, magicians, musicians and conjurers. This particular year, there were two fire performers. One of them had given me a demonstration earlier in the evening, so I could work out my camera settings for when they performed, later in the evening. That was a tremendous help, as it gave me the chance to play around with a variety of camera settings until I got the balance I wanted. I knew that, if I stood behind one of them, I would be able to see the faces of the audience, illuminated by the flame. I also used a flashgun to illuminate the fire performer better. It was a spectacular show and part of an amazing night that got double page spreads in both the local newspaper, a local “glossy” magazine called Simply Southport and a full page in Lake District Life & Lancashire Life. We’ve managed to get this level coverage for the event every year, because the organisers, local press and I have worked together as a team. We want to make sure that the event sells out every year and that as much money as possible is raised for good causes. If you want to see all of my photos from that night, they are here. 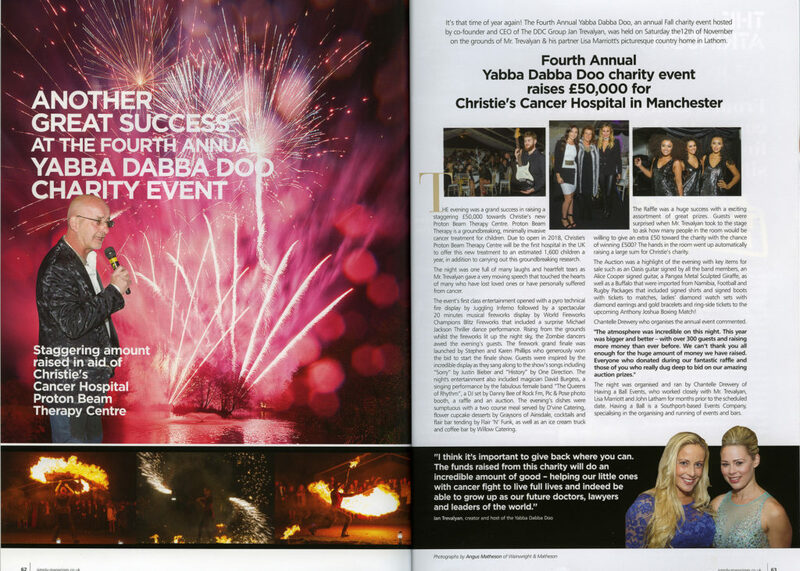 Double page coverage of annual charity party “The Yabba Dabba Doo” in December 2016’s edition of Simply Southport magazine. 1. Issue your photographer with a Running Order well in advance. Agree a deadline with him or her for the photos to be available to release. I’m often asked to turn work around in 24 hours. 2. Allow space for a “photography area” that is slightly away from all the tables. Use roller banners or branding in the background for your organisation or the name of the event. If the event is being sponsored, make sure the sponsors’ banners are visible. Make sure this area is well lit. 3. Prepare a list of photographs required – key people / groups. On the day, make sure that there is someone who can round up the key people and take them to the photography area. Ideally, you want to get these photographs taken early on. 4. If you are hoping for coverage in local newspapers, magazines or trade press, you need to liaise with them in advance. These days, local newspapers have very limited journalism resources and even less photographic resources. You need to be in a position to write up the event (or pay for someone who can) and to supply captioned photographs. 5. Agree deadlines with the publications for copy and photographs that you know can be delivered. If the Editor has reserved a double page spread for you and you don’t deliver, you’ll never get a second chance. This is why you always want to hire professionals. 1. Try to check out the venue before the guests arrive. Every location has its own quirks which you will have to adapt to. The marquee for the Yabba Dabba Doo party had black walls and ceiling, which meant I had to use a different flash set up to the one I normally use. 2. Never forget that nobody looks good when they are eating. 3. A group of middle-aged men saluting the camera with pints of beer isn’t a classy look and they invariably look like naughty schoolboys. Wine glasses and Prosecco flutes look okay in guests’ hands. 4. Nobody will thank you for taking their photo after 10.00 pm in the evening. Make up may be smudged and clothes are starting to get crumpled. Many faces will be pink and shiny. 5. If you can, use a flash modifier, rather than bare flash, which is rather cruel close up. I use a Gary Fong flash modifier for events. 6. Local press love spectacular photographs and, if there are fireworks planned, make sure you have your kit set up in advance, since firework displays never last very long. I will do another article about firework photography nearer to November. Taken with a Canon Eos 1Dx and a Canon 24mm – 70 mm f2.8L II lens at 55mm and a Canon Speedlite 600 EX II. Exposure 1/125 second at f6.3. ISO 800. One of the biggest challenges for any photographer is to get their subjects to relax during a photo shoot. Most people aren’t used to encountering a professional photographer unless it’s at a wedding. A regular client of mine is a retailer of equine clothing and accessories called Equiemporium. Rather than use professional models, they like to use actual riders for photo shoots and, during a recent shoot, they used top professional show jumper, Sammy Borthwick, who is one of their sponsored riders. My photo of her is at the start of this post, modelling the new range of House of Montar clothing. When I first photographed Sammy, a few years ago, she was quite nervous as she had never modelled before. Whilst she looked much happier as the shoot progressed, it made me realise that not everyone is comfortable when they are being photographed. Other than professional models, most people aren’t used to being photographed. One part of the shoot was Sammy riding Heiki, a Dutch horse that had been trained to rear up to order. Sammy was wearing a £700 coat in this photo. It is one of my all-time favourites and appears in an earlier post. If you haven’t seen the photograph before, click on the link – it’s spectacular. If the person who you are photographing isn’t feeling relaxed it will show in the photographs. There will be a certain stiffness in their pose and perhaps a forced smile. It doesn’t matter whether it is a fashion shoot or business or family portraits, if the person you are photographing does not feel relaxed, you are not going to get good photographs. Over the years, I have learned how to make people feel relaxed, so that they enjoy the photo shoot and I am able to make them look their best. I take a lot of business portraits and I’ve forgotten the number of times I’ve heard the phrase “Right, we’ve got ten minutes for this” which invariably is said by the business owner / Chairman / CEO who doesn’t really “get” the importance of business portraits. Rush a photoshoot and nobody is going to look relaxed and natural. Your subjects will most likely end up looking a little shifty. Switch the mobile phone off (including your own.) Your subjects will be able to return any missed calls soon enough. Everything about my camera kit is big. The camera bodies, the lenses, the flashguns – they are all big. If a person is only used to being snapped by someone using a smartphone or the family holiday camera, they might well find my kit rather intimidating. Ideally, I would like to meet the person(s) I’m photographing in advance of the shoot, if that is at all possible, when I’ve not got a camera in my hands. Even a few minutes spent with a person or a group really helps. If I’m doing business portraits, I always ask whoever has booked me to tell me if there are any people who are nervous about being photographed. If there are any nervous people in the group, I will turn up early and spend some time chatting to them before I get the camera kit out of my bag. If anyone is feeling nervous, I get them to breathe deeply in and out of their nose for a minute or two without speaking. This is also a good idea if you are about to make a speech; it will help you to relax. Everyone has a personal space that they feel comfortable in and don’t want to share with anyone else. We’ve all been in situations where someone stands right next to you while they are talking. It’s not comfortable, is it? For portraits and fashion shoots, I like to use an 85 mm lens, which means I will be standing about 12 feet away from my subject. It means I’m not invading their space. The 85 mm lens I use cost me a stupid amount of money but it produces the most amazing results. I used it for the first photo in my second post about business portraits and I used it for the first photo in this post. You never regret buying quality and I think that my clients deserve the best. I have attended some classes run by top Dutch fashion photographer Frank Doorhof, who I consider one of the best tutors I have ever known and who is an all round good guy. Aspiring photographers who are reading this post should follow my link to his website. He is very generous with his free advice. It was in one of these classes that I first heard Frank explain why a photographer should never touch the person they are photographing – male or female. Not even to remove a loose thread off their clothing. It’s okay for another person, like a stylist or make up artist to touch your subject but not the photographer. You are breaking the sense of trust that you and your subject started off with. If you are doing a shoot with no-one else present, tell your subject what you want them to change for themselves. A hand mirror will come in useful. Whether it is a professional model, someone who is there for a business portrait, or a personal portrait, you need to do a running commentary on the photographs you are taking. As well as giving them instruction in the next pose you want them to adopt: “raise your chin a little”, “turn towards the camera”, “give me a little smile” etc. you need to reassure them as to how well the shoot is going. Digital cameras typically display an image on the rear LCD screen for a couple of seconds and it is worth checking your photographs in between shots. Not only will this tell you if you have some exposure or focus problems, it will also convince your subject that you mean what you say when you say “this is great”. The more you reassure your subject, the better they perform. They relax. They show a natural smile. They engage with your camera. They begin to trust you. They will give you the photo you wanted from the very beginning because they are now enjoying the process. You have travelled a journey together and, if you are going to do a shoot together in the future, it will be so much easier for you both. 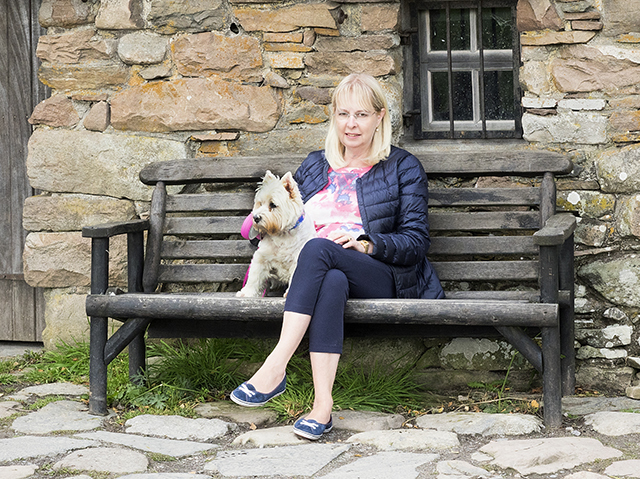 In the photograph at the beginning of this post, I got Sammy to sit on a garden bench. The sun was coming from behind her, which gives a nice “rim lit” effect to her hair. I then used a silver and gold reflector to bounce the sun back on her face and clothing. It’s a piece of equipment I always use for outdoor photography of people. A similar effect can be achieved if you have someone to your side holding up a piece of flipchart paper. House of Montar, who make the jacket, had that day’s photographs on their Facebook page the same day that Equiemporium released my photos on their Facebook page. A good result all round. This is the third photo that appears on the landing page of our website. Taken with a Canon Eos 1Dx and a Canon 85 mm f1.2L II lens. Exposure 1/200 second at f5.0. ISO 200. In my previous post about Business Portraits, I covered why they are important to your company, planning the photo shoot, the best time to hold it, dress code and background or location. I hate the term “Head Shot” as the sort of photo you have on a passport or security ID is going to do nothing for your business – or for you. You want to have proper portraits that help tell a story about your people, your company and you. If you are planning a location for the business portrait shoot, ideally you want one where there is the option of open air or under cover. In the example shown to the left, I photographed the Senior Partner in a firm of Merseyside-based accountants on the edge of the colonnades that form part of Albert Dock in Liverpool. Over his shoulder are “The Three Graces” which are the famous three buildings on Liverpool’s Pier Head, that are a UNESCO World Heritage site. This accountancy firm was keen to be identified with Liverpool and anyone who knows Liverpool knows The Three Graces. In a group shot for this firm, I placed the staff underneath the same colonnade, while I stood on a staircase nearby to get the shot. It was a typically windy day at Albert Dock and I was getting wet as I took these shots, but any photographer expects a little discomfort from time to time. The important thing was – we got the photos in an environment that anyone who knows Liverpool would recognise immediately and no member of staff got wet. Getting wet is not a good start to the working day! A good alternative is to use your business premises as the background – possibly using some of the company branding as part of the portrait. The photograph of the young business woman, at the beginning of this post, was taken using only natural light that was coming through a window in a warehouse and some overhead lighting. No flashgun or studio flash was used for this shot. The blurred yellow shape you can see in the background is a fork lift truck. Without necessarily knowing what the shape is, you know this is an industrial environment. Whilst a group photo shoot should be enjoyable, it does often bring out the inner child in most people. I always try to do individual photos of people on a strict 1:1 basis, so that they won’t be distracted by other members of staff. 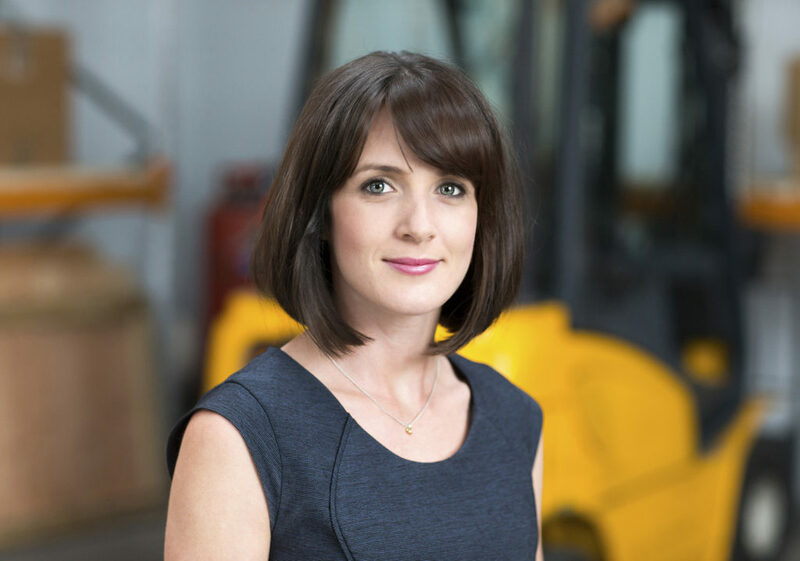 Make sure there is somewhere that the other members of staff can sit or stand out of sight of the person who is having their business portrait taken. As you now know that a shoot is going to take longer than you originally planned for, make sure that there are bottles of water, maybe some snacks for staff and a hand mirror so that ladies can do last-minute checks on make up, or men can comb their hair. Everyone becomes very self-conscious during a photo shoot like this. If the photo shoot is outside and the weather is cold, bring a few wraps so that those who haven’t come in coats don’t get cold, or get them to wait in cars until they are called. The whole process should be enjoyable for everyone. Apart from at a wedding, most people never have their photograph taken by a professional photographer during their lifetimes. For me, one of the greatest pleasures is to see the reaction I get from people who I have photographed, when they see themselves in the final, finished image. And yes, I have seen people in tears, when they see themselves or a loved one in a really good photograph. It makes me feel very privileged to do what I do. It’s a good idea to develop a company portrait style as it helps to convey a sense of team spirit to everyone who will view your business portraits. Once you have worked out what the company portrait style is – stick to it. If you are not sure what style to go for because you’ve never done this exercise before, spend a little time looking in the “About Us” pages of other companies. Quite soon, you will see a style that really appeals and you can send the URL to your photographer so he or she knows the look you would like. Alternatively, look in business publications for photographs that you like, cut them out and send them to your photographer. A big advantage of having a clear company portrait style is that, when new members join your team, it’s not too difficult to get a photo of them that looks like it was taken at the same time as all the original team photos. This is probably why many companies opt for the white background look but if you have a location you will always have access to, it won’t be difficult for your photographer to re-create the look. I know it’s not something that is discussed in polite society, but let’s talk about money. In your company, if all business portraits have, to date, been shot on a smart phone, you will probably get a surprise at what professional photographers charge for their services. But once you have had business portraits shot by a professional, you will never go back. You and your staff will never see themselves in the same light again. A professional photographer will work closely with you to plan the shoot, agree on a company style and take the photographs with equipment that costs a small fortune (my kit is insured for well over £20k.) Why so much? These are the tools of my trade and I believe that my clients deserve to be photographed with the best kit that I can buy. Your photographer will then spend more time processing the photos than has been spent on the photo shoot. He or she will work with you and your team to pick the best images and possibly do some further processing of them. This is not a quick process. In the past, the way that some photographers charged for their time and the right to use images was often less than transparent, verging on the arcane. I give an upfront quotation that I stick to, as I know from my own experience of running companies that delivering projects on budget is everything. If I do a business portrait shoot and hear that just one member of staff isn’t happy with his or her photos, I will come back and re-shoot for no extra charge. Let’s remember this is also a team-building exercise and we want everyone to feel good about themselves. I trust my clients and I want to build long-term relationships. When I come back in the future to shoot a company’s business portraits, I want to be greeted as a friend by those who remember me. I keep archives of photographs that I have taken for companies, both on hard drives and online. If a newspaper needs a photo of someone I have photographed, I can send a link that they can download in seconds. It’s all part of the service. Banks and shareholders don’t lend to or invest in companies, they lend to or invest in people and they will want to know what you look like. Last year, 10% of all the photographs that have ever been taken since photography began, were shot. Most of them were taken on smart phones and most of these were awful. If you ever look at most Profile Photos on Facebook and other social media, almost all of them are pretty dreadful for reasons I won’t over-analyse here. Even senior management in large companies often have poor photos on social media. So why not incentivise your team by offering an extra photo or two in a less formal style, as an add-on to the more formal business portrait shoot? It will add very little to the cost of your business portrait photo shoot. Once your team have great business portraits, they certainly won’t want the traditional bad-lit, out of focus photo of themselves that they have been using on social media for the past few years. First photo taken with a Canon Eos 1Dx and a 85mm f1.2L II lens. Exposure 1/400 second at f2.8. ISO 400. 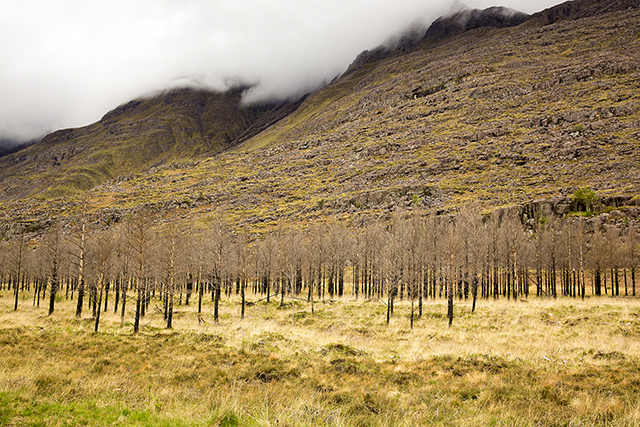 Second photo taken with a Canon Eos 1Dx and a Canon 24mm – 70mm f2.8L II lens at 70mm. Exposure 1/60 second at f5.6. ISO 800. 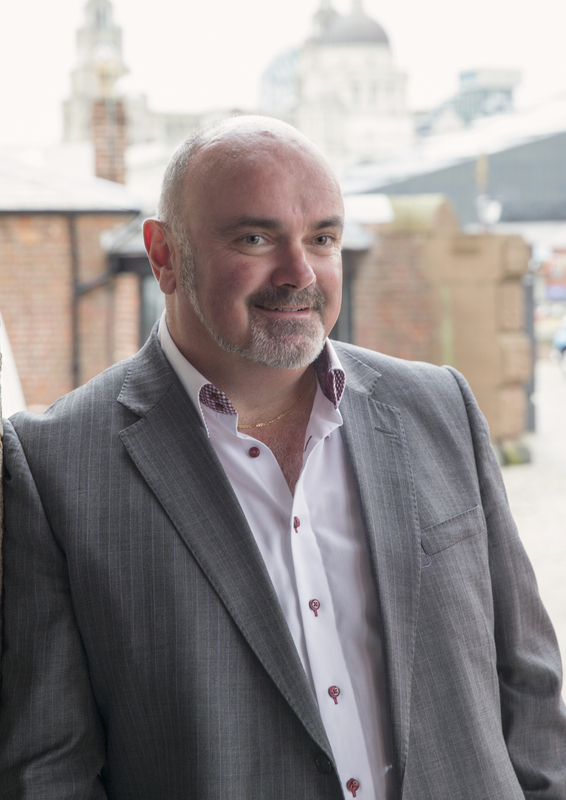 Apart from the largest companies, who physically publish Annual Reports, the main requirement for new Business Portraits is normally when businesses and organisations – of all sizes – decide to update their websites. The “About Us” section of a website is almost always the second most-read section of any website and that is where you will usually see a collection of Business Portraits. So, with all the above in mind, if you were thinking about allowing just five or ten minutes per person in your office for photos, think again, especially if you are wanting some group shots as well. This is the first part of a two part guide that will help you get the best results out of a Business Portrait shoot. Even if a professional shoot isn’t in this year’s budget, there are enough practical tips here to dramatically improve how you could appear on your website and on social media. However long you initially think that a business portrait session is going to take, allow for double that time. A photographer will want to take a lot of photos of each person and the group. Groups and sports teams are always difficult to photograph because you can guarantee that there will always be a “blinker” amongst them. When I’m photographing groups or sports teams, I normally shoot about 12 to 15 photographs of the same pose, knowing that at least one of them will have everyone looking at the camera, eyes wide open. Getting all your staff together for a photo shoot can be a good team building exercise and most staff enjoy the process. Be aware, however, that some people really don’t like having their photo taken and may have a very poor self-image. If their only experience of having their photo taken is in a photo booth or via a smart phone, it’s no wonder they feel this way. Take time to speak to your team and warn your photographer in advance if any members of staff seem genuinely nervous about having their photo taken. An experienced photographer will take the extra time needed to get these members of staff relaxed and will pose and light them in such a way that they all look good. You will be amazed what this can do for someone’s self-esteem. The best time of the day for a business portrait shoot is first thing in the morning. Everyone looks at their best – no crumpled clothes or smudged make-up and no five o’clock shadow on the men. If you are shooting outdoors, the light is also better than in the middle of the day, when you will get dark shadows on peoples faces if it’s a sunny day. Avoid school holiday time for group shots. Invariably, one of the team will be away. Also avoid the first few weeks of September if possible, as many of your staff will be sporting Mediterranean tans and shiny faces from having spent two weeks in the sun. It is possible to tone down a shiny face but, sadly, some photographers who do business portraits don’t bother to do the extra work required in post-processing to make people look their best. I do because I care about the people I photograph. Make sure that your staff have a similar dress code. Decide in advance whether men should wear ties or not. Think about how formal or casual you want everyone to look and then make sure that everyone sticks to that code. Discuss this with the team in advance and get everyone to describe what they plan on wearing. Then send the list over to your photographer in advance as he or she will be able to advise you on any potential problems. If you do decide that men will be wearing ties, bring a couple of spare ties for the chap who turns up without one. Having a similar dress code helps project a “team image” in both the collection of individual photos and in the group shots. The plain white background is still seen in business portraits but I think it is a bit past its sell-by date and does little to help tell the story of you or your organisation. I hate the phrase “Head Shot”. We all have to use them for passports and ID passes but a white background head and shoulders shot tells the viewer nothing about you or your business. It’s a missed opportunity. Given the choice, I prefer to use an outdoor location whenever possible because people relax much more quickly outdoors. It’s also a good opportunity to give your business a sense of location by using well-known landmarks in your town or city. If I can’t use an outdoor location, then an indoor location with a view still works well. Coming from a banking background, they were only used to having photographs taken against a plain white background. 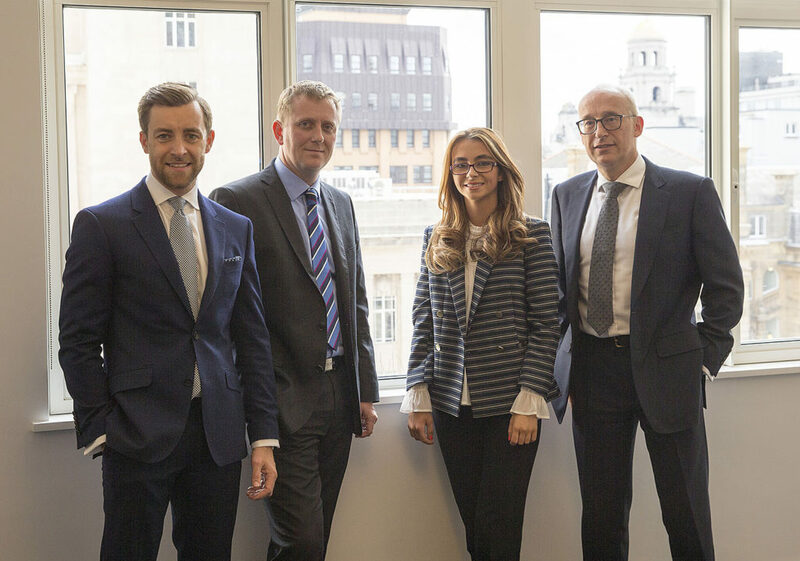 Having discussed the “story” that they wanted to tell, we agreed that we would use what was obviously a city centre location, but without making it specifically Liverpool, as they have clients all over the country. We also discussed the image they wanted to convey of themselves – friendly and professional. More examples of our Corporate and Commercial photography can be seen here. Taken with a Canon Eos 1Dx and a Canon 24mm – 70mm f2.8L II lens at 47mm. Exposure 1/160 second at f5.6. ISO 200. Walk into the main lounge at Southport & Birkdale Sports Club and you’ll see a large canvas wrap of this photograph on the wall. It sits next to one of the doors that lead out onto the patio, which overlooks the cricket ground. As Southport & Birkdale is often used as an “out ground” by Lancashire County Cricket Club, the lounge receives hundreds of visitors a year. The club is also a popular venue for events and this is the most commented on photo of the six that I have hanging around the main lounge. My other five canvas wraps show senior cricket, mens hockey, ladies hockey, tennis and squash – all the sports that are played at Southport & Birkdale Sports Club. So many people have told me that this photograph perfectly captures the spirit of junior cricket. Everyone who sees it smiles. It still makes me smile every time I see it. This canvas wrap shows two Under 11 cricketers in action, with the Ormskirk wicket keeper stumping the Southport & Birkdale batsman. The fact that they both played wicket keeper for Lancashire CCC at their age level added to the rivalry and the noise they both made. Until the club asked me to photograph some junior cricket, I don’t even remember watching a junior match here (and we’ve been members for 25 years.) Now, I probably prefer it to senior cricket. Junior cricketers play with such passion and determination; it is a pleasure to capture the action. They are ambitious and are not afraid to take risks. 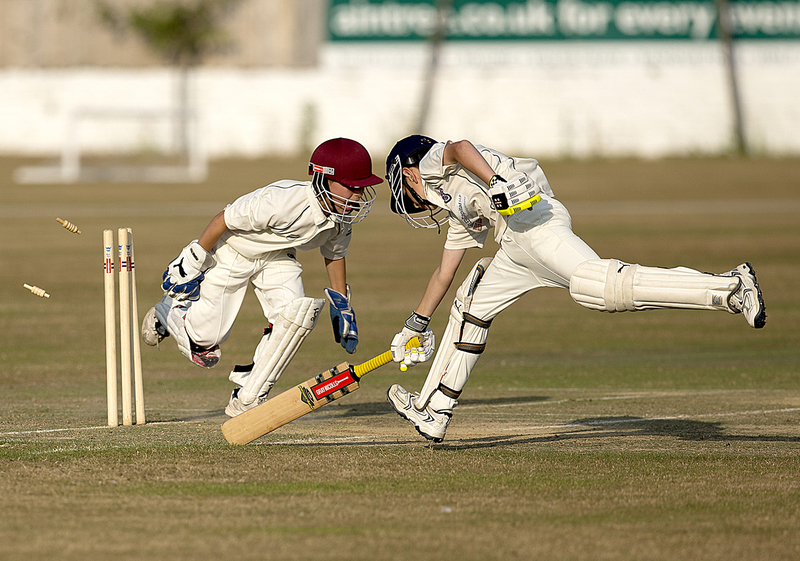 Most junior cricket is played in the early evening, during the week. With Southport being on the west coast of England, it means we get lovely golden light on the ground as the sun starts to dip towards the Irish Sea. This means I can use some really high shutter speeds that freeze the action. The camera I use for sports photography lets me fire the shutter at 12 frames a second, at speeds of up to 1/8,000 of a second, which is how I can freeze bales flying up in the air. I used a monopod to give the camera extra stability and opened the 300 mm lens up to its maximum aperture of f2.8. This is how I get the out of focus background – an effect known as “bokeh”, which makes the two cricketers apparently pop out of the picture. To get the most benefit out of a monopod, you need to stand with your legs at shoulder-width apart and, with the monopod at a slight angle forwards, lean in towards the camera. That way, you are effectively becoming two thirds of a tripod. It’s also a comfortable position to stand in for long periods of time. This photograph won me a Silver Bar from The Guild of Photographers and both sets of parents have a replica of the canvas wrap. It is a photograph that has served me well. Taken with a Canon Eos 1Dx and a Canon 300 mm f2.8L II lens on a Gitzo monopod. Exposure 1/6400 second at f2.8. ISO 200. I took advantage of some free time between Christmas and New Year to do some housekeeping on our website and to select 10 photographs that would represent the variety of work we undertake. It’s one of those jobs you keep putting off until you have to. Over the next couple of weeks or so, I will be writing about each photograph – the story behind it, how I took the photograph, the settings I used and so on. I will explain why I chose each photograph. I began as a sports photographer, specialising in motor racing. It’s still a great love of mine but over the years, I have been doing more cricket and rugby. I will tell you the techniques and settings that I use. I was taught portraiture by the top photography school in the country and this is an area of work where Liz and I really enjoy working together. I’ll describe how I approached three very different portrait shoots. Another favourite is event photography where I can give you some tips that will deliver great results, even if you are only using a smartphone. Product photography is another favourite – particularly food. I’ll show you how to make even a humble dish look great. I’ll then show you an idea for making your holiday photographs look very different to everyone else’s. I’ll also give some hints as to how you can improve your own photography; it’s not all about having expensive kit. I’ll begin with the story behind the two young cricketers – a photograph that has served me well since I took it and which you can see as a large canvas wrap print, hanging at Southport & Birkdale Sports Club. I am often asked, with the huge improvements in the cameras fitted to smartphones, why anyone should buy a conventional camera? Most of the photographic work that I do these days is transferred to my clients on a USB drive or via an online gallery where they can download my photographs and add them to their own libraries. Frequently, when I ask the client if they want the images only as 300 dpi or as both 72 dpi and 300 dpi, I’m met with silence. It seems that a lot of people don’t really understand what Dots per Inch, or DPI means, and are afraid to admit it. Nobody should be afraid to ask for help. Having started doing my own printing 44 years ago, I’ve grown up with the transition from film to digital and I’m happy to advise anyone who finds a lot of camera and software “speak” a foreign language. So for anyone who wants to gain a better understanding, this is a simple guide. All digital images, whether they are photographs or graphics, are made up of thousands of tiny dots. Smartphones, by default, record at 72 dpi and cameras normally record at 300 dpi. It doesn’t sound like such a huge difference – but it is. 72 dpi means 72 dots per inch horizontally by 72 dots per inch vertically. So 72 dpi x 72 dpi gives you a total of 5,184 dots of information in a square inch. 300 dpi means 300 dots per inch horizontally by 300 dots per inch vertically. So 300 dpi x 300 dpi gives you a total of 90,000 dots of information in a square inch. That’s more than 17 times as much information as in a square inch of a 72 dpi image. So, why not plan on photographing everything at 300 dpi? There are two reasons. 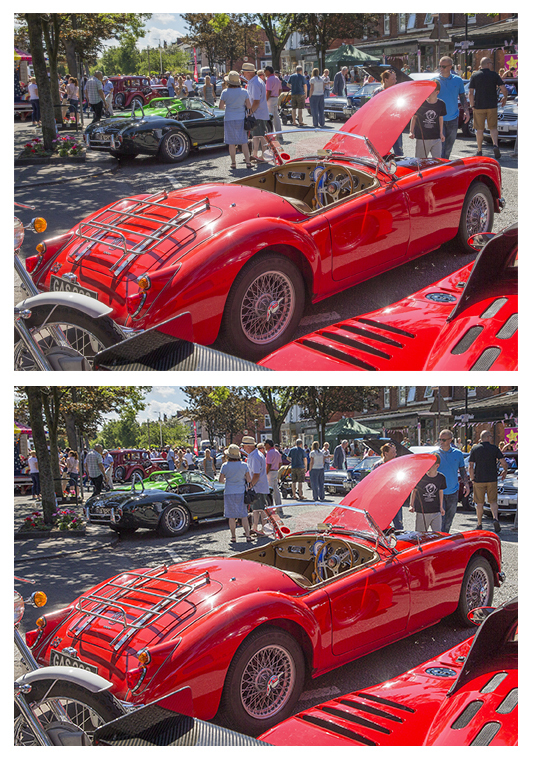 One is the size of files that are generated at 300 dpi and the other is that, if an image is only going to be viewed on a computer screen, smartphone or tablet, you don’t need 300 dpi files. Some web designers reckon that 100 dpi to 125 dpi is good for the latest “Retina” screens on mobile devices, but the files are still a fraction of the size of a 300 dpi image. Take a look at the two photographs below. One has a resolution of 72 dpi and the other is 300 dpi. Can you tell which one is which? It’s unlikely you can because the screen on your computer, tablet or smartphone simply cannot make use of the extra information that is contained in a 300 dpi file. The 300 dpi image at 7” x 5” has a file size on disk of 3.31 Mb. The 72 dpi image at 7” x 5” has a file size on disk of just 312 Kb, which is less than a tenth of the 300 dpi version. 300 dpi files are for printing. 300 dpi is also the limit for what the human eye can see in a print. Of late, we have all got used to storage getting cheaper and cheaper. We’ve got used to free Wi-Fi and super fast broadband wherever we go. So we’ve all got a bit casual about file sizes. We’ve forgotten about the days when portable storage was on 1.44 Mb floppy discs (which would hold just four of the above 72 dpi photos.) We’ve forgotten about dismal dial up modems that transferred data at glacial speeds and e-mail systems that would fall over if you tried to send anything other than the tiniest file attachment. So why worry about file sizes in the modern era of computers and smart devices? It used to be believed that, if a website landing page didn’t load within 10 seconds, the viewer would go elsewhere. With tablets and smartphones, people now expect pages to load instantly. If you have lots of un-optimised images on your website, that slow down pages from loading, you are going to lose your viewers. Look around in any public place these days and you will see people frenetically scrolling down the screen of their tablets and smartphones. Everyone is in such a hurry to see what one of their thousand closest friends has got to say for themselves today! Your own website analytics will tell you what percentage of your visitors are using mobile devices and you can be certain it will only be going up each year. If you are only need 72 dpi images, why not just use a smartphone all the time? The built in cameras you find in the latest smartphones are so much better than they were even just a few years ago. With a little bit of care and a minute spent processing the image, you can get results that are more than acceptable for blog posts and social media. But the images will still not be as good as those that have been shot on even a relatively cheap camera at 300 dpi and then dropped down to 72 dpi on a computer. People think that, the more megapixels a smartphone camera has, the better the final result will be. It certainly helps but the quality of lens that you are shooting through is even more important and smartphones are still playing catch up. I use an Apple iPhone 6 Plus. The current equivalent model is the 8 Plus, which costs £799. In the photograph at the beginning of this article is what I call my “holiday camera”. It’s a Sony RX10 Mk II that can currently be bought for £810. It produces the most incredible images that are more than capable of being printed to over A3 size, thanks to its Zeiss lens and having one of the best camera sensors made. It is beautifully built and will last for very many years. Cameras costing a fraction of what the Sony costs will still produce better photographs than a smartphone (for now at least) as that is what they have been designed to do. If you are part of that generation who have never used conventional cameras before, find a friend with a conventional camera and borrow it for a weekend. It will open your eyes to another world. 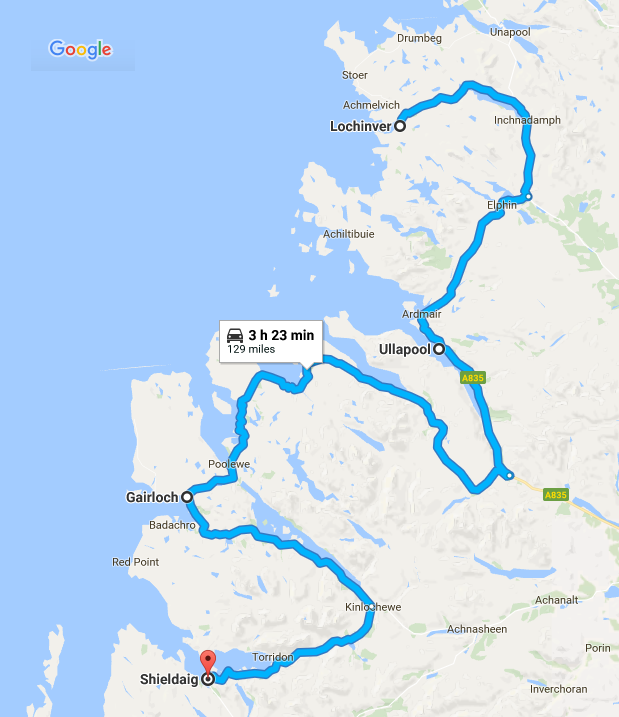 My first post described our planning for our trip round the North Coast 500. My second post covered our first day, travelling from Inverness to Melvich. My third post covered our second day, travelling from Melvich to Lochinver and my most recent post described our trip from Lochinver to Shieldaig. After a short time heading South, we would spend most of today, travelling East back to Inverness. Leaving Shieldaig, the following morning on the A896, we passed by the village of Kishorn, which I will cover in a separate blog post. Some 40 years ago, as part of my A Level Geography course, I wrote an article about the impact of the building of (what was then) the largest dry dock in Europe in this village. It was created to allow the building of the concrete oil rig called the Ninian Central Platform that was destined for the North Sea. Well worth a visit on this road is the award-winning Kishorn Seafood Bar. It’s best to check their website before you go, as this is not open 12 months of the year. The A896 is a pretty tough road to drive on. It is a single track much of the way and is very twisty in places. By now, you will be thanking me for my advice to do the NC500 anti-clockwise. 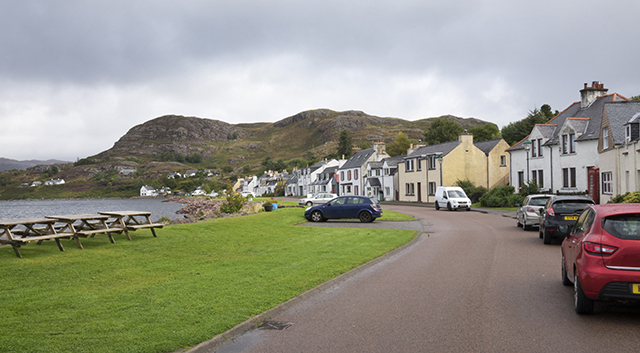 If you are feeling particularly brave, you can do a detour round the coast via the village of Applecross. 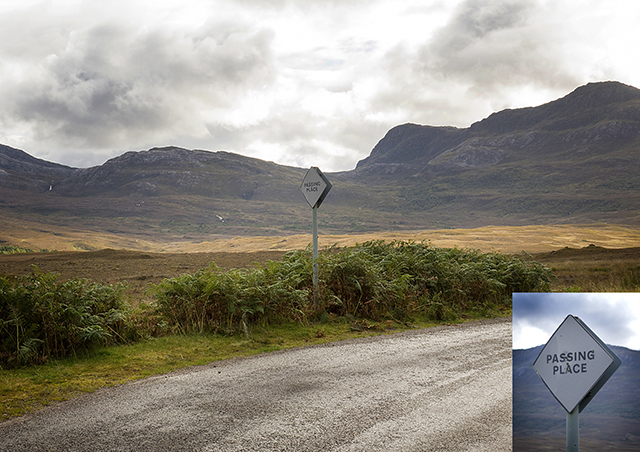 You will then go back to the A896 on the famous Bealach na Ba (the Pass of the Cattle.) This is a tightly winding single track road, which holds the record for the steepest ascent of any road in the UK. I’ve driven on it in the past and I would only recommend driving on it in the best of weather. There is an excellent, illustrated article about this road here. Next, we arrived in Lochcarron. This is a lovely village on a sea loch, which means a lot to me. It’s where my maternal grandparents lived and where my mother, her brother and her sisters were born. I have fond memories of Easter holidays spent at my grandfather’s house when I was a child. I remember fishing in the nearby burn (stream) and watching my grandfather feeding a robin that would come to his hand. 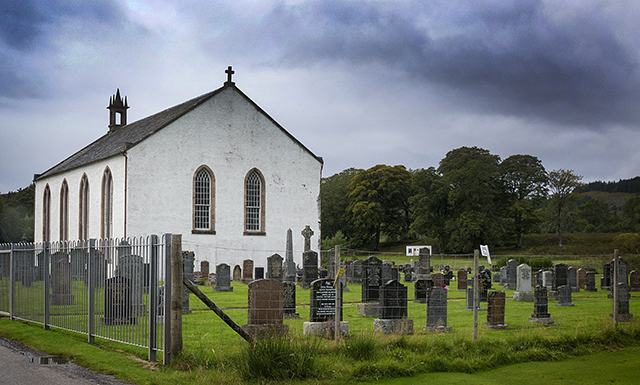 Both sets of my grandparents are buried in the Lochcarron Burial Ground, along with two sets of aunts and uncles, so we always stop off here. On my maternal grandparents’ grave is a memorial to my mother’s older brother, Sgt Finlay MacRae, who is buried in Berlin. On his 13th mission as a tail gunner in a Lancaster bomber and just a few weeks after his 19th birthday, he was killed in action. At that point in the war, the life expectancy for RAF Bomber Command aircrew was just 3 missions. From now on, we would be heading East. The route back to Inverness from Lochcarron is quite easy nowadays. It used to be mainly single track roads with passing places but is now a mixture of single track roads and dual track roads that are easy to navigate. We covered the final 77 miles of our journey in 2 hours, averaging 39 miles per hour. In total, we had covered 486 miles over 4 days. 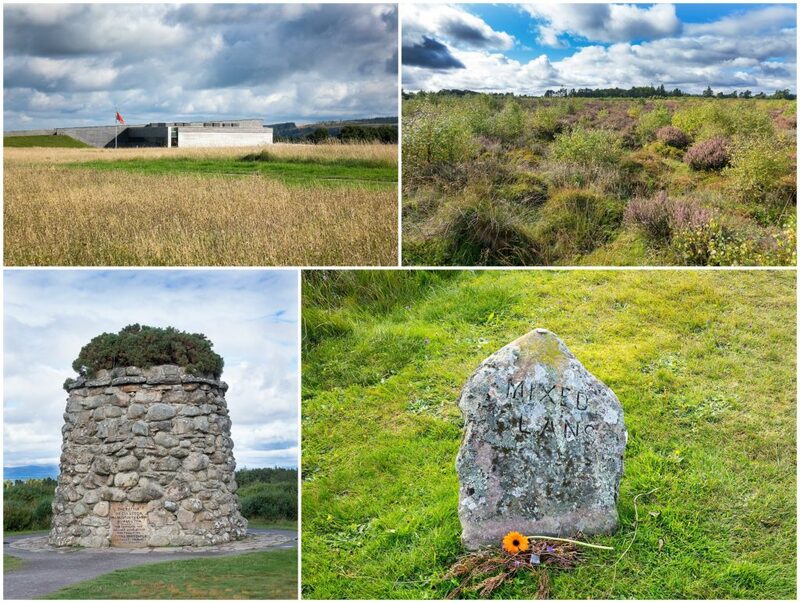 Whilst the Culloden Battlefield isn’t on the NC500, it is just a few miles East of Inverness and, as Liz had never seen it, we called in before checking in to our hotel in Inverness. If you are ever in this area, I can recommend a visit. The Visitor Centre is excellent and what is, in reality, a war grave for Scottish and English soldiers, is strangely beautiful. 4 days and 3 nights spent on the greatest motoring adventure in the UK. The North Coast 500 has been a hugely successful marketing exercise but it is not without its critics. Those who can benefit from the spike in tourist numbers are fans but those who are doing jobs that do not benefit from the increase in tourism are highly critical of the increase in traffic and the congestion this creates. So don’t forget to let locals go past on single-track roads. You are on holiday; they are trying to do their jobs. As I previously mentioned, the tourism infrastructure lags behind the demand for hotel rooms, bed and breakfasts and campsites. But I have no doubt that this demand will be filled by the entrepreneurs who have been drawn to this area. In the years to come, this route is only going to get busier and busier. I doubt if there will be many improvements in the quality of the roads that make up this route – and that will be part of the continuing appeal of the NC500. It has its challenges and when you have completed the trip, you do feel that you have achieved something. 1. Visit the NC500 it before it gets too busy. 2. 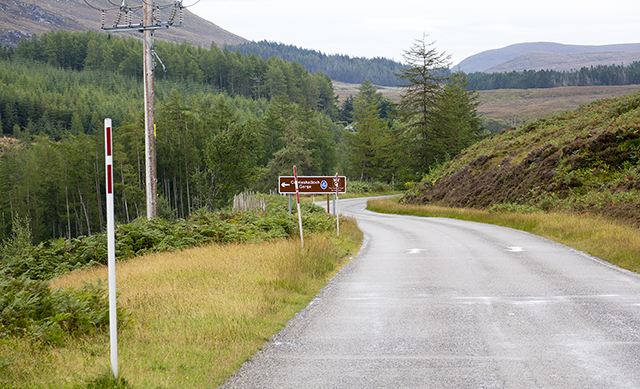 Travel round the NC500 via the anti-clockwise route. We did the trip in 4 days and with 3 overnight stops but there is more than enough to see and do on this route to make it a week long trip. 3. Use a proper camera, rather than use a smart phone. Digital cameras can now be bought for very reasonable prices and will give you archivable, printable memories for many years to come. For my work as a photographer, I normally use a Canon Eos 5D Mk III and a Canon Eos 1Dx with a battery of lenses. 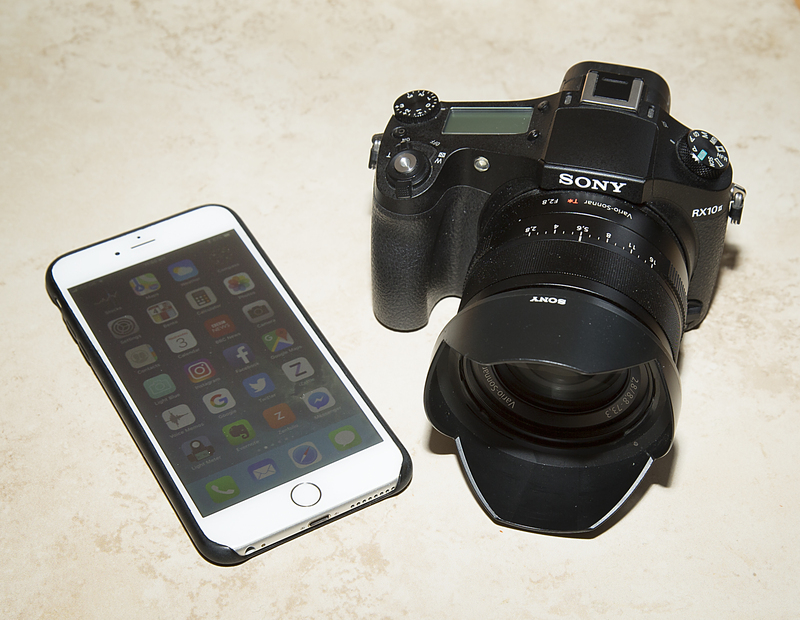 On this trip, I used just a single Sony RX 10 Mk II, which has a fixed Zeiss 24mm – 200mm f2.8 zoom lens. It is the perfect camera for trips like this but there are much cheaper cameras available if the photos are just for yourselves. All my photos of the North Coast 500 can be seen at www.angus-matheson.co.uk/nc500 and I am happy to answer questions from any reader who is thinking about planning their own adventure. In my first post, I wrote about our preparations for this journey. In my second post, I wrote about our first day, going from Inverness to Melvich. In my most recent post, I wrote about our second day, travelling from Melvich to Lochinver. 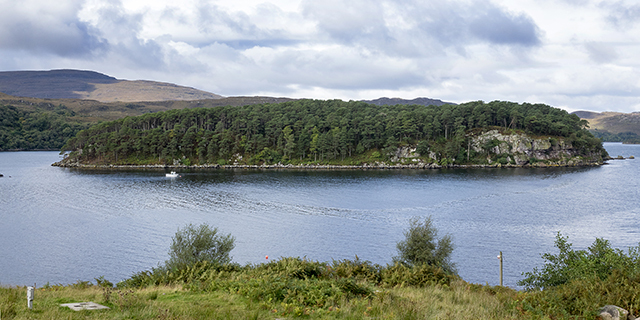 Today we travel South from Lochinver, down the coast to Shieldaig. 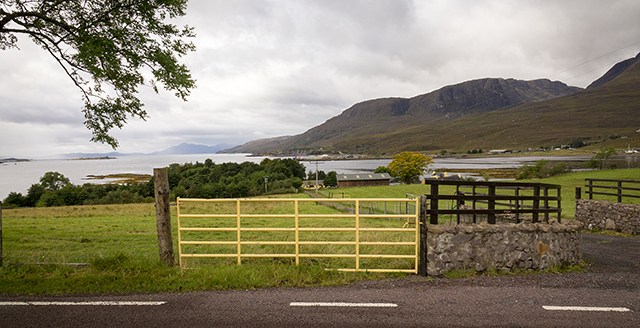 After a night in Lochinver, we travelled on single track roads that are a real test of your driving skills, down to Ullapool, which is on the coast. This was the final stopping off point for the Russian Convoys during WW2. You can still see the fuel tanks set into the hillsides. The A832 road. Note the snow poles. South of Ullapool we turned onto the two lane A832, which took us along the side of Little Loch Broom and then around the coast. Many stretches of this road have snow poles on either side, so you can navigate after there has been a heavy snowfall. These are quite common in this part of Scotland. Near to Inverewe Gardens, we had our first proper encounter with Highland Midges. September is the worst month for them and they have to be the most vicious little beasties I have ever come across. Don’t come to the Highlands without Midge repellent. Visit Smidgeup.com to order repellent and get updates on Midge activity in the Highlands. 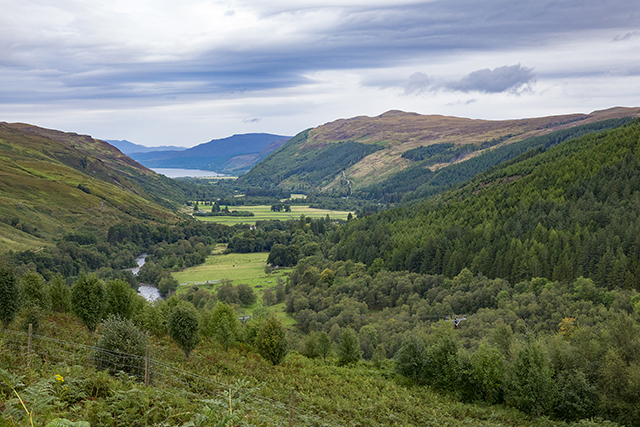 The scenery on the west coast is dramatic, with steep-sided mountains, covered in low cloud and fast running rivers feeding little lochs. Visitors are advised not to use passing places as temporary car parks, so that they can take photographs. Passing places serve two functions (a) to allow traffic coming in the opposite direction to go through and (b) to allow faster traffic behind you to overtake. With regard to the latter function, visitors should avoid holding up locals, whose knowledge of these roads means that they will always be quicker than you are, whatever car or van they are driving. Passing places are marked with white diamond shaped signs, many of which have been used for target practice by local shooters. Passing Place. Inset – note the bullet holes. We called in to Gairloch, where two sets of aunts and uncles used to live. I have fond memories of this village from holidays I spent here. My Uncle Hamish was the GP for this area and my Uncle Hugh used to drag me round the 9 hole Gairloch Golf Course, in the hope of turning me into a golfer. Our next overnight stop was in the village of Shieldaig, which often appears in the list of the prettiest villages in the UK. We stayed in the Tigh an Eilean Hotel, which belonged to my paternal grandparents after WW2, along with the village Post Office and I have cousins who live in the village. This part of Scotland is famous for the quality of its locally caught shellfish and fish which feature heavily on the hotel’s menus. The village name is a Viking word meaning “Loch of the Herring.” The waters on the West coast of Scotland are some of the purist in the world and most of the locally-caught shellfish are exported overnight to Spain, where they fetch the best prices. 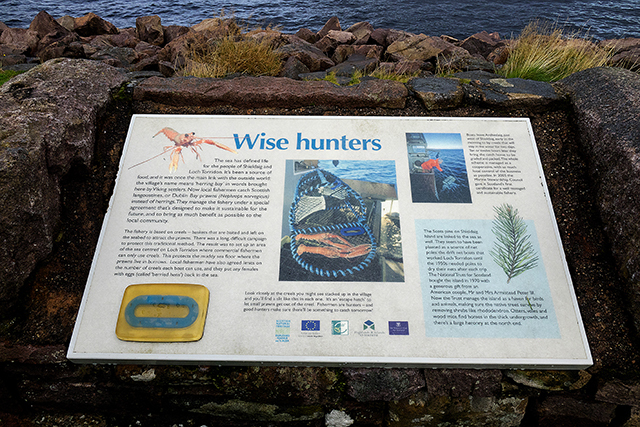 There is a display board in the village entitled “Wise Hunters”, which commemorates the local fishermens’ careful approach to conservation. On this board is a photograph of one of the fishermen, my cousin John MacGregor and the “escape hatch” that he designed to allow smaller langoustine prawns to escape. For this invention, he was given a conservation award by HRH Prince Charles and he also featured in one of Rick Stein’s “Food Heroes” programmes. We highly recommend The Loch Torridon Smokehouse for their smoked salmon and they offer a mail order service. I can’t think of any smoked salmon that I’ve tasted that is better than this. Facing the village is Shieldaig Island, which is now a nature reserve. There is a heronry on the island and enormous Sea Eagles nest here. You can see them from the road. On our third day on the NC500, we had travelled 129 miles at an average speed of 37 miles an hour. A relatively easy drive but I knew that tomorrow, we would face one of the toughest roads in the country. All content Copyright © Wainwright & Matheson. Highly experienced professional photographers specialising in commercial, portrait and sports photography, working in Cumbria, Lancashire, Merseyside, Greater Manchester, Cheshire and other UK locations on request.